I was not sober when I decided this would be a good idea. 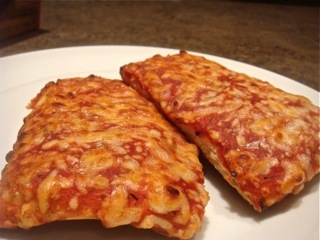 If you’re new to the blog, I’ve been occasionally testing frozen foods (mostly pizza) to see if there are good options on the market for those rare nights you can’t cook for yourself. Criteria is flavor, quality and sustainability of the ingredients, and convenience. However, this time it seems my criteria was a healthy combination of intoxication and nostalgia. 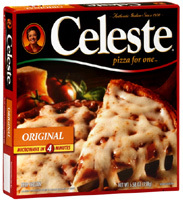 Strange as it seems, Mama Celeste’s frozen pizza was one of my first forays into “cooking”. When I was in college, I’d doctor up a plain pizza with fresh garlic and herbs, and call it a meal. Although it was only cooking in the silly “semi-homemade” sense of the word, it really did provide a launching point for future endeavors like doctoring up pasta sauce, which lead eventually to making my own pasta sauce. And I thought the pizza was pretty decent, too. Oh boy. But Mama Celeste is no more. The pizza was once made by an actual Mama- Celeste Lizio. Lizio sold the recipe to Quaker Oats, it was then sold several more times, and is now owned by Pinnacle Food Group. Pinnacle has a proud history of taking once great brands (Duncan Hines, Swanson, Lender’s, Vlasic) and turning them into industrial food byproducts. They also own nutritional powerhouses Armour & Mrs. Butterworth’s. You see where this is going. The pizza sells for $1.49 at Albertson’s in Los Angeles. It’s a pretty quick trip from freezer to plate. One minute in the microwave, five minutes in the oven. You get 20% of your recommended Vitamin C. I’m not sure how that happens, but it does. There are 39 ingredients listed. 39! The only ingredients that I understood were tomato puree, water, salt, sugar, and spices. The vast array of chemicals was impressive. Impressive in a very very scary way. Please pass the L-Cysteine Monohydrochloride? The imitation cheese made me want to punch myself. It tasted like…ah….like I wanted to punch myself. Who made this stuff? Bad scientist. Bad bad scientist! 1020mg of sodium. Wow. I generally don’t watch my salt intake, but that is ridiculous. 45% of your RDA intake in one horrible little disk. I guess they needed all that extra salt to cover up the horrible flavor of the imitation cheese. Or the 34324 chemicals. You can microwave it, but I wouldn’t. Even with the crisping tray, it’s not very nice. It is a terrible mockery of pizza. I wonder if my palate has changed, or if this pizza-like thing has changed. I suspect it’s both. Would I have it again? Never. I didn’t even finish this one. Lesson learned. Decided to take a break from trying mediocre frozen pizzas for something more practical. Trader Joe’s frozen food case has several intriguing items, and I chose the chicken breasts “glazed with a sweet & tangy Asian style marinade”. It tastes really good. Impressive, actually. Super convenient. All you have to do it take it out of the freezer, put it in the oven, and in 15 minutes you’re eating. Inexpensive. The price at the Trader Joe’s in Silverlake is $4.99/lb. No preservatives or crappy chemical ingredients. All ingredients listed pronounceable and understandable. The bag is not resealable. Come on Trader Joe’s, it’s 2010. Make a resealable bag so we can put what we don’t use back in our freezers. No information on where the ingredients come from. $4.99 is a good price for chicken, but it leads me to believe these are big industrial chicken breasts. Chicken is slightly dry. Not overwhelmingly so, but it could be improved. Wide variety in portion size. Some breasts were giant, some were quite small. Just like life, right Trader Joe’s? You got me, Trader Joe’s. You got me good. 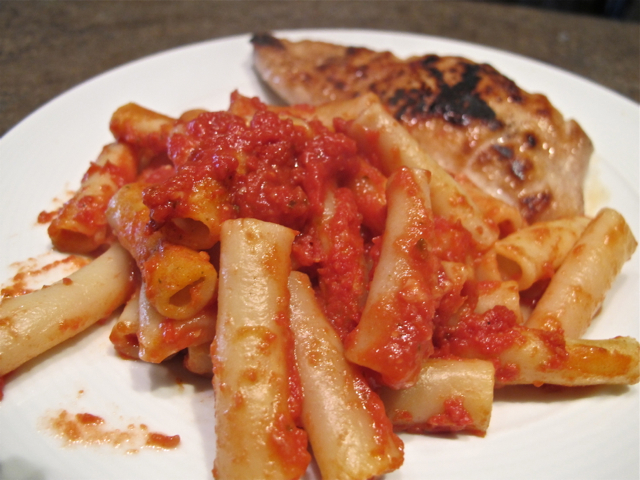 Your frozen marinated chicken breasts are convenient and cheap, and, more importantly, are quite pleasant to eat. They’re not as good as home cooking, but I’m pretty sure I’ll be keeping a few in my freezer for an occasional lazy Wednesday night. 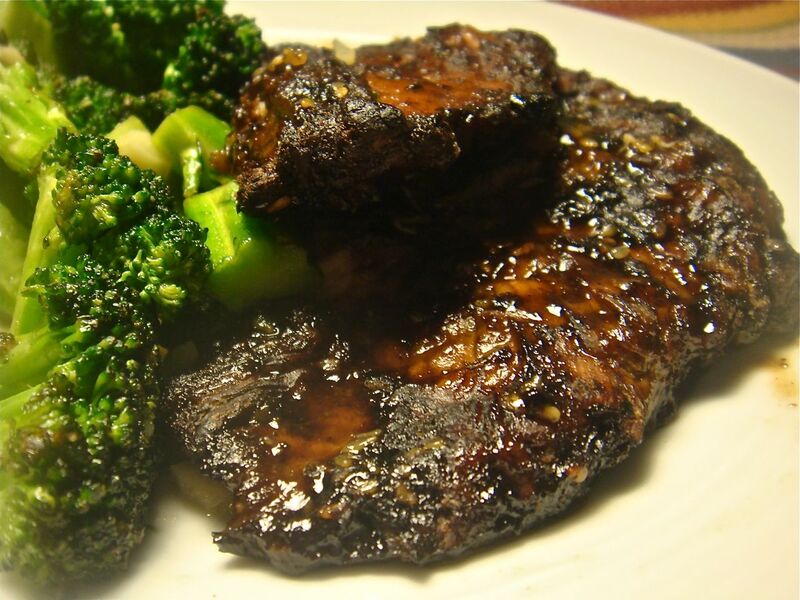 *That broccoli looks good too, right? That, my friends, was not frozen. It’s easy to make, so you should try it. Well, well. I’m trying another frozen pizza. Probably a bit too soon, because I’m still thinking about all the pizza I ate in NYC. 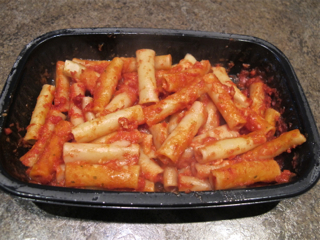 But, if I’m going to plod my way through frozen food, I have to plunge in. 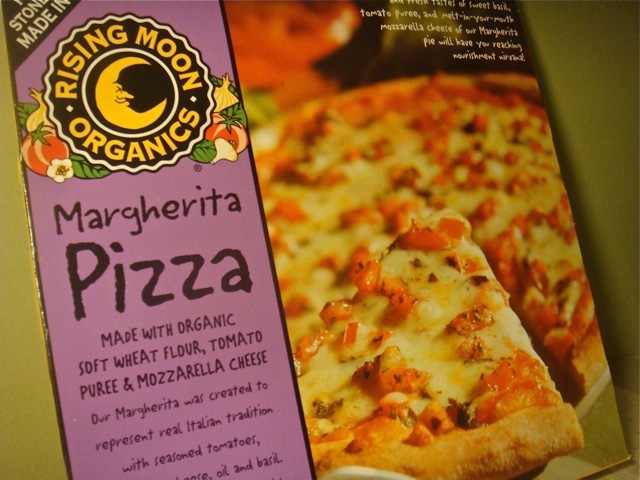 I chose a Rising Moon Organics margharita from Whole Foods. Rising Moon is a vegetarian cooking line based in Providence, Rhode Island. The company was founded in 1991, and its mission is nothing short of world peace through food. While that might be a bit of a tall order, any company that’s serious about feeding the world in a better way is alright by me. Even if they are vegetarian. I especially enjoyed the organic gardening tips on Rising Moon’s website. Now on to the pizza. Well made crust. Had a nice bite to it. Crispy. Very enjoyable. Herb flavor mingled well with the diced tomatoes. Positive, progressive mission. Thought put into sourcing of ingredients and packaging. Long time coming: instructed to defrost for 10 minutes, cook for 10-13 (needs the full 13), and then wait for it to cool. Unevenly spiced. Some bites were great, some underwhelming. Really bad text on the packaging: refers to pizza several times as “she” and says that “she” will “steal my heart forever”. Imported from Italy. I don’t have a problem with this entirely, but a company that thinks about how it affects the planet might want to produce more locally. Pretty good for a frozen pizza. The crust was a real highlight, one of the best frozen crusts I’ve had. The tomatoes and herbs could have been a bit more even, but the flavor was right on. It’s a shame the cheese wasn’t that tasty, because when it comes down to it, you can’t have a good pizza with crap cheese. I appreciate what Rising Moon is trying to do, and would so even more if they didn’t import their pizzas from Italy- that’s not much of a selling point these days. Would I have it again? Sure, but probably not anytime soon. I was wandering through the frozen food isle the other day, thinking about how long it had been since I’d eaten anything from it. So I thought it might be an interesting idea to test the quality of frozen foods these days. 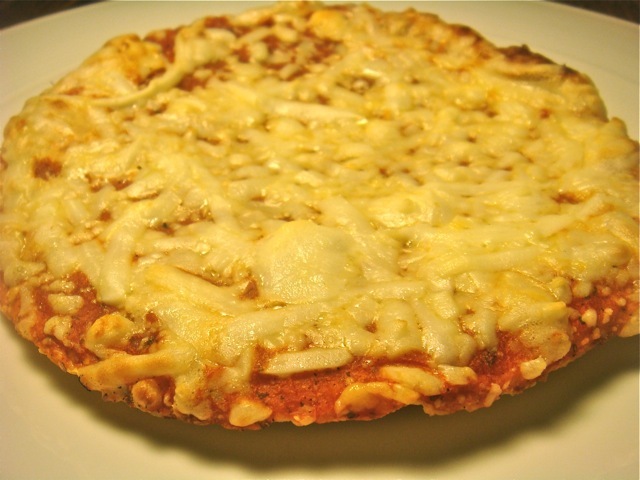 First on the list: Hal B. Klein eats a frozen pizza. I chose the Pacific Natural Fire-Baked Thin Crust, with pepperoni. If I’m going to eat a convenience food, it might as well start with a pizza, right? Pacific Natural is an organic food company located in Oregon. They are known mostly for their organic soups & broths, and have now expanded into boxes teas/mates/nut drinks, as well as frozen pot pies & pizzas. 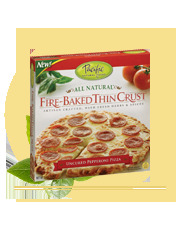 Good Ingredients: Pacific Natural’s pizza is made with better stuff than you’ll find in most frozen pizzas. Crust & sauce contain no high fructose corn syrup. Cheese is made from actual cheese. Topping to the edge: A pizza needs an edge. How am I going to hold it if you top it all the way? Not actually a thin crust: You can’t call your pizza thin crust, and then not deliver on it. While we’re talking crust- it didn’t have any give. Too soft, for sure. This is the area that needs most improvement. Took longer to cook than advertised: Box instructions suggest cooking for 12-14 minutes at 400 degrees. After 12, the pizza looked very undercooked. At 14, it seemed edible, but still not perfect. I ended up leaving it in the oven for 16 minutes. That’s a little too long for something meant to be convenient. One could have a pizza delivered in nearly the same amount of time. Not bad, but it didn’t make me feel all giddy inside, either. 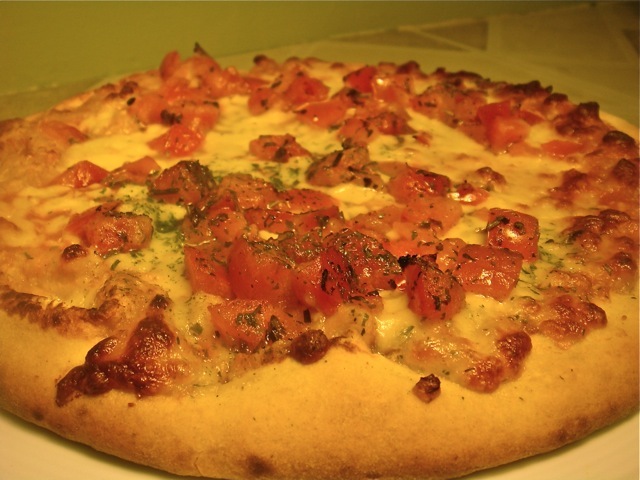 Pacific Natural is trying to build a reputation for wholesome foods; however, unlike their soups, teas, and pies, the “artisan” pizzas contain no organic or sustainable ingredients. Also, they are factory made, which makes them not artisan at all, and I don’t like cheeseball slogans. Would I get it again? Too soon too tell. My frozen pizza experience is still too limited. It’s a step up from Mama Celeste, at least. 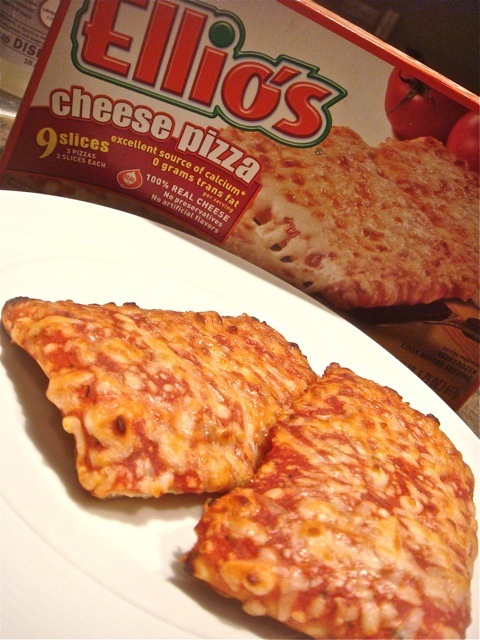 But is there really a frozen pizza that will ever satisfy my pizza obsession?